Good Afternoon Blues and welcome to Thursday’s news updates from CFCnet, where we take a look at the latest Chelsea news, transfer rumours and anything else surrounding the Stamford Bridge club. As we approach the weekends game against Tottenham, there has been a surprise breaking story in the last couple of hours concerning an apparent interest from Chelsea in Spurs and England front man Harry Kane. It’s pretty safe to say though, this is highly unlikely. For a start, the rumour seems to have surfaced from The Mirror, so not a great track record of getting rumours correct. Also, Manchester United also want Kane, but perhaps more importantly – Daniel Levy has said his striker is not for sale at any price. We remember back when he refused to allow Luka Modric to join Chelsea, its near impossible that he’ll allow Kane to join their London rivals, even if he wanted to leave. Again, with Gareth Bale, he was only allowed to leave abroad. But never say never in this crazy business! Meanwhile, Gary Cahill is apparently keen on negotiating an extension to his Chelsea contract. With Chelsea’s ‘over 30’ rule meaning that when a player reaches that age, only a one year contract extension will ever be offered. Cahill turns 30 next month, which if the rule is adhered to, means he will only be offered another year. So the reports are saying that he is attempting to get a longer extension secured over the next three weeks in order to confirm his future with the club. I’m not sure whether the club will offer a long extension here, with new central defenders being explored to come in, but a year will certainly be offered. Whether Cahill will agree to this and a pay cut, remains unclear. I believe that Cahill is a top defender and is underrated at times. I’d love to see him stay and be a part of the squad, but he may have to admit to being a lesser part player if the likes of targets John Stones comes in and Michael Hector gets recalled. 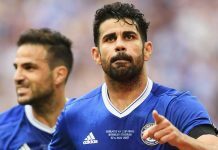 Finally, the clubs patience seems to be wearing thin on the future of Diego Costa after an abysmal season so far for Chelsea. Seemingly caught up in the drama’s, dire positioning and a lack of goals have made for a disastrous time for the Spaniard as well as him being unsettled in England. According to The Guardian, Costa has been given two weeks to prove that he still cuts it to lead the Chelsea attack and fire them in to the next stage of the Champions League. Personally, I feel there are better options out there for us. Costa has aggression, strength and usually a fairly decent eye for goal. But I have never really seen him as world class, he’s nowhere near a Sergio Aguero or Luis Suarez level, which is the calibre of forward that we need to lead our line. I have always found him clumsy and head down on the ball, he tries to run through players and doesn’t really seem to know where he is going. But it’s his positioning that frustrates me the most. He can be good in the air but never gets in to the box or in a poachers position enough to capitalise. He drops deep, goes wide and would rather get involved in the creative players jobs rather than make the runs to be on the end of the play to finish it off, or play off the last man. Like I said, I wouldn’t be sad to see him leave, but of course I support him and hope he proves me wrong in the next few weeks.